While Tribes have a wide range of food preferences and eating habits, their lunch choices are dictated by their circumstances e.g. leftover food from a wedding to working in a canteen. A rare few of our members make more considered choices based on their principles but for the most part, Tribes often let their appetites make the decisions for them. 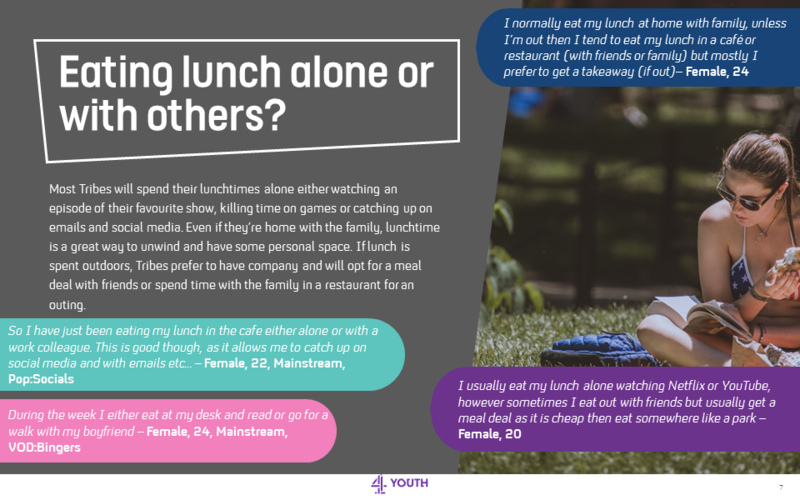 eating Lunch alone or with others? 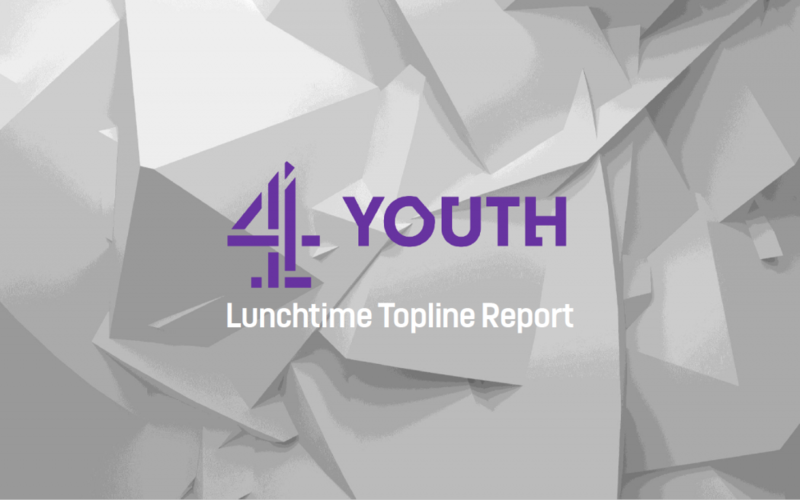 Most Tribes will spend their lunchtimes alone either watching an episode of their favourite show, killing time on games or catching up on emails and social media. Even if they’re home with the family, lunchtime is a great way to unwind and have some personal space. 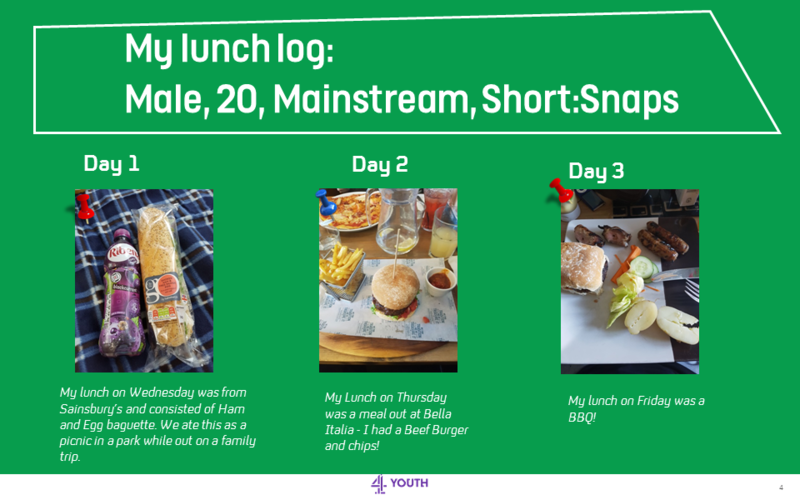 If lunch is spent outdoors, Tribes prefer to have company and will opt for a meal deal with friends or spend time with the family in a restaurant for an outing. 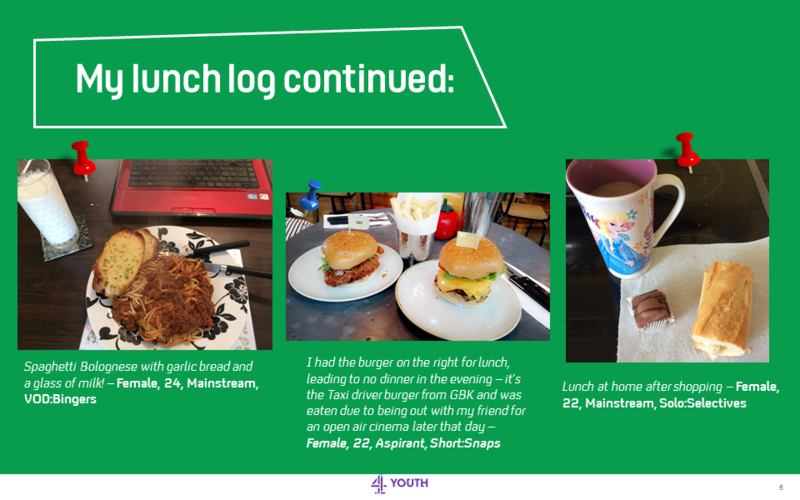 12-12.30pm is the prime time Tribes start thinking about lunch when bellies start grumbling and the hunger pangs kick in. The majority of Tribes make their lunch and eat at home while a third go out to buy lunch. The rest put in some effort and bring in a packed lunch either made by them or a relative. 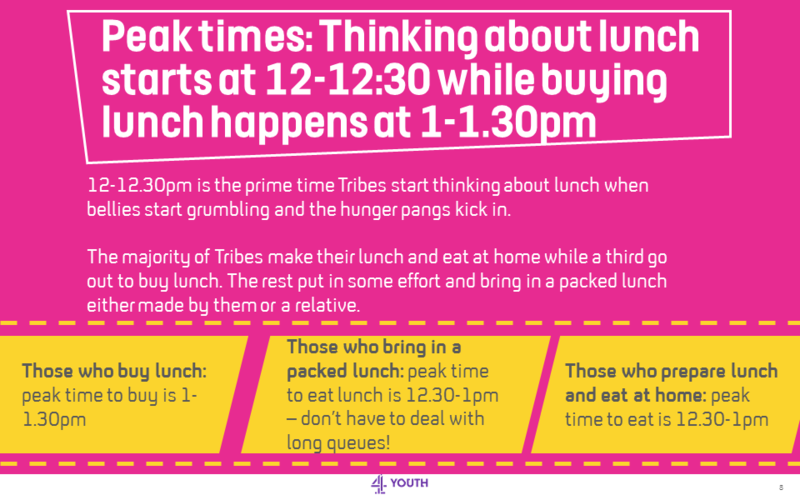 Those who bring in a packed lunch – peak time to eat lunch is 12:30-1pm – don’t have to deal with long queues! Key drivers for lunch purchase decision? 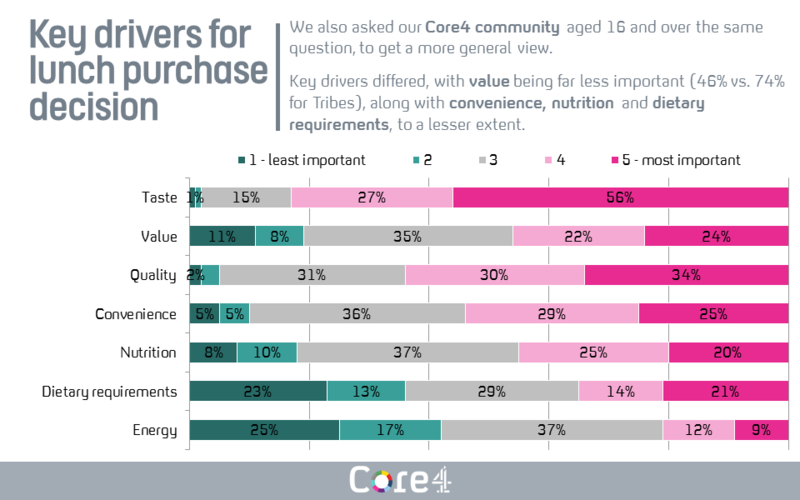 We explored what choices Tribes make before they buy their lunch. 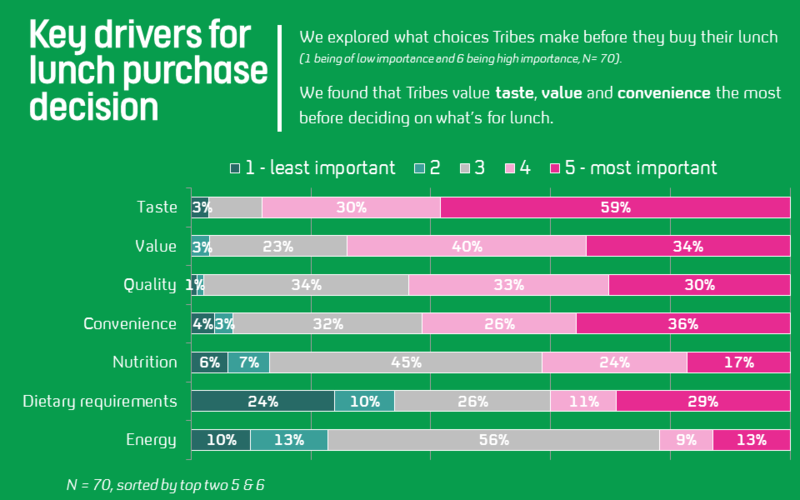 We found that Tribes value taste, value and convenience the most before deciding on what’s for lunch. 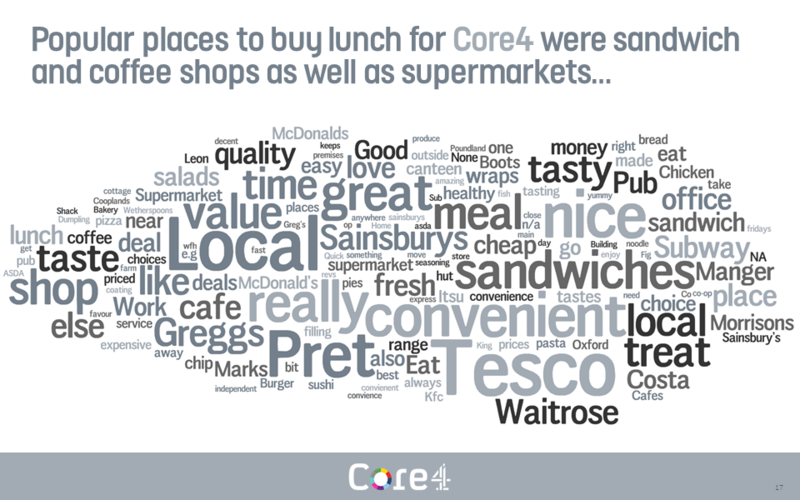 We asked Tribes where they like to buy and eat their lunch and received an array of varied responses. 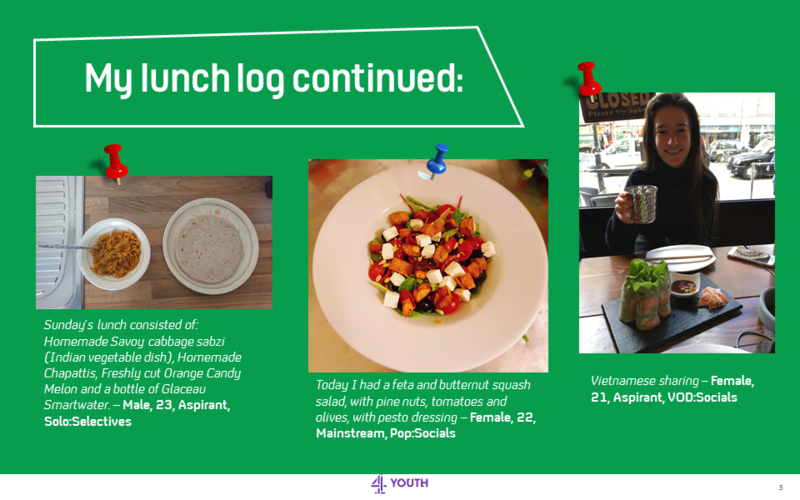 Young adults in 2018 are growing up with a variety of food on their plates which encourages them to explore the different food options available. Tribes generally lean towards fast food choices when it comes to taste because they consider burgers, fried chicken and pizza as treats that are quick and convenient to purchase. They’re aware that indulging at fast food shops doesn’t make for an ideal everyday lunch but sometimes they enjoy eating junk food. 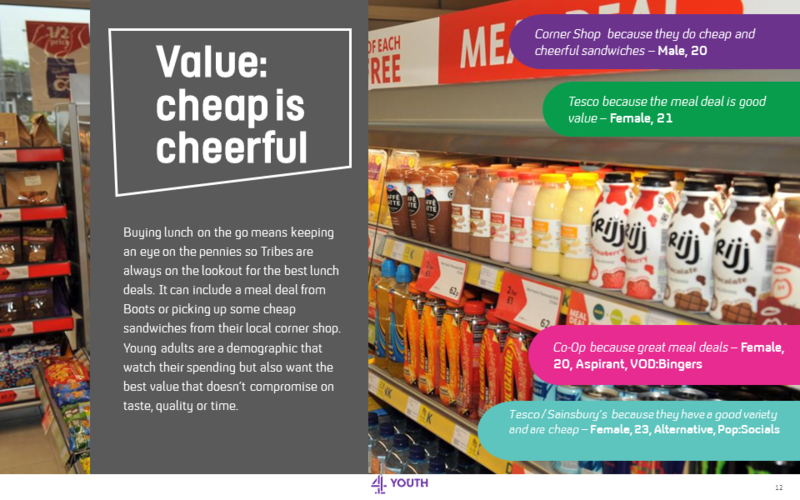 Buying lunch on the go means keeping an eye on the pennies so Tribes are always on the lookout for the best lunch deals. It can include a meal deal from Boots or picking up some cheap sandwiches from their local corner shop. 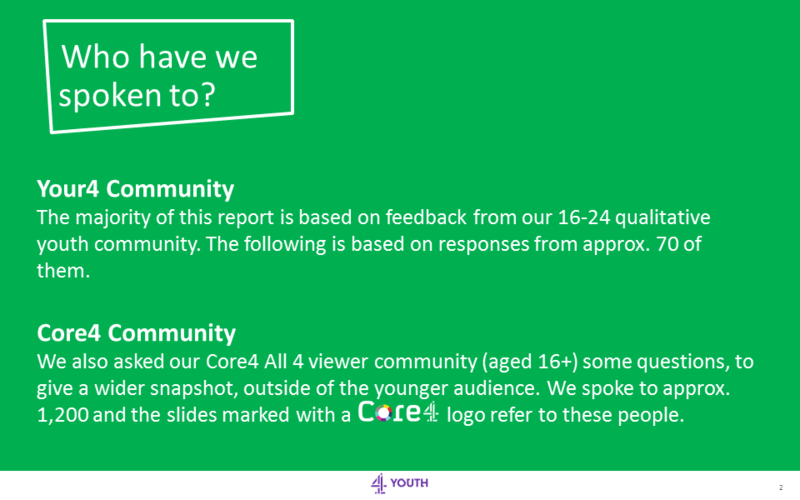 Young adults are a demographic that watch their spending but also want the best value that doesn’t compromise on taste, quality or time. 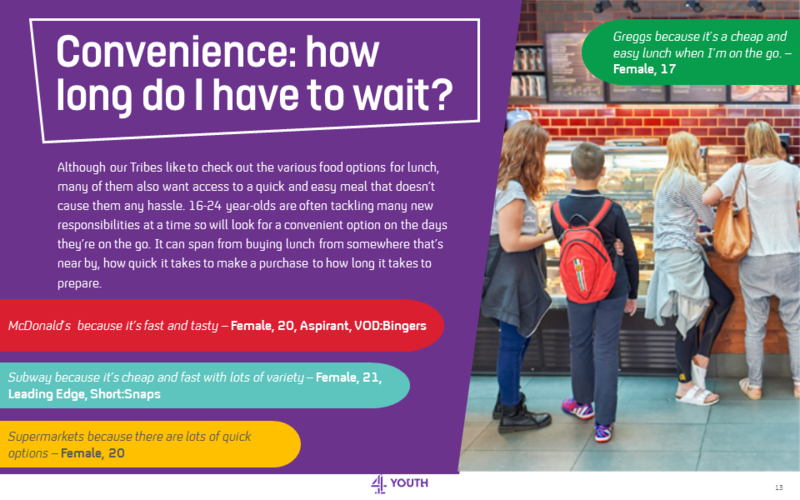 Convenience: How long do i have to wait? 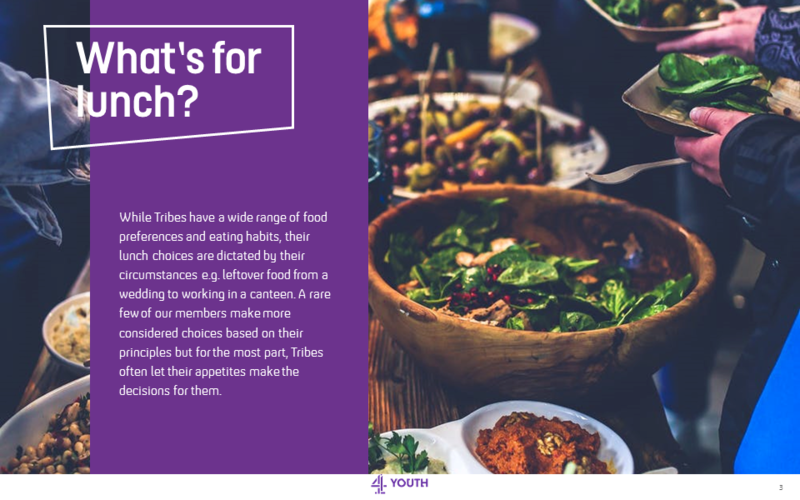 Although our Tribes like to check out the various food options for lunch, many of them also want access to a quick and easy meal that doesn’t cause them any hassle. 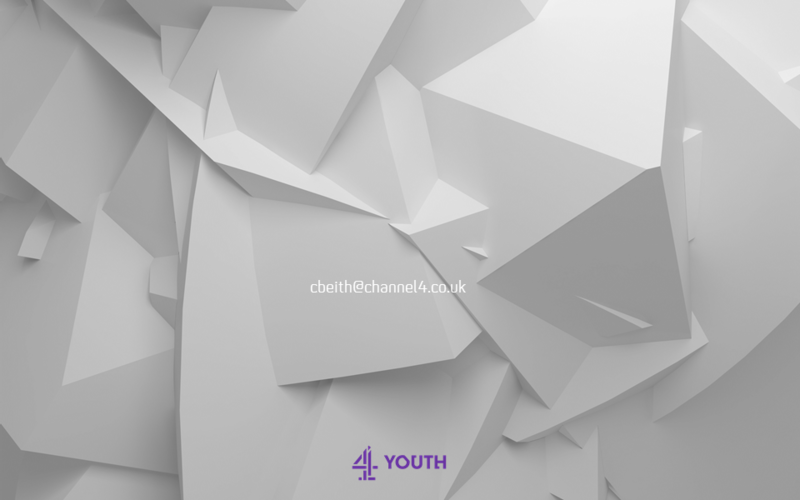 16-24 year-olds are often tackling many new responsibilities at a time so will look for a convenient option on the days they’re on the go. It can span from buying lunch from somewhere that’s near by, how quick it takes to make a purchase to how long it takes to prepare. where do they love to eat? 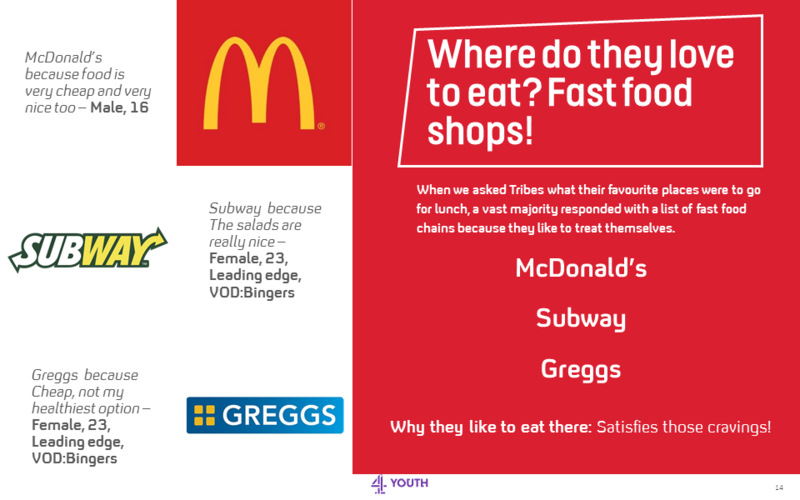 Fast food shops! 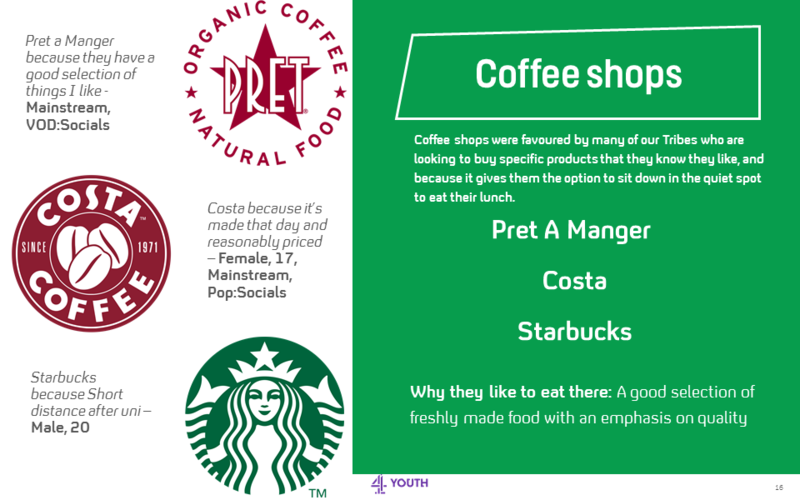 When we asked Tribes what their favourite places were to go for lunch, a vast majority responded with a list of fast food chains because they like to treat themselves. Why they like to eat there: Satisfies those cravings! 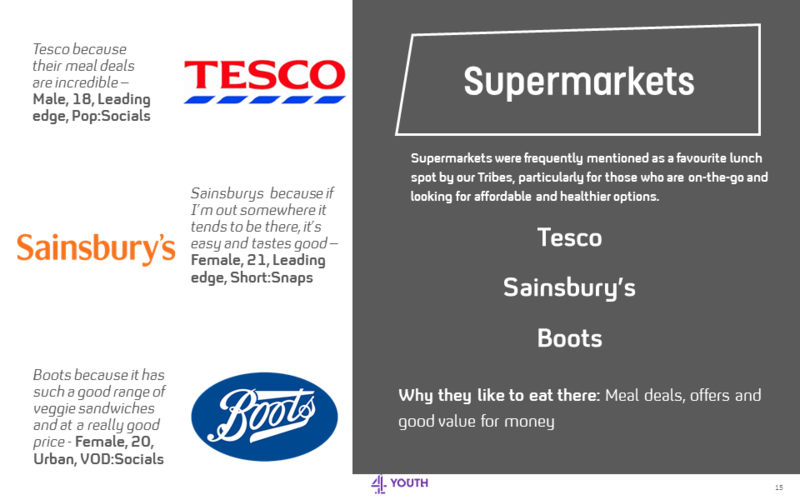 Supermarkets were frequently mentioned as a favourite lunch spot by our Tribes, particularly for those who are on-the-go and looking for affordable and healthier options. Coffee shops were favoured by many of our Tribes who are looking to buy specific products that they know they like, and because it gives them the option to sit down in the quiet spot to eat their lunch. Most of our Tribes are meat eaters with a minority of the community being vegetarians and pescetarians. Although they love meat, this doesn’t sway them from other alternative options where the likes of a vegetarian or vegan lunch will pique curiosity. 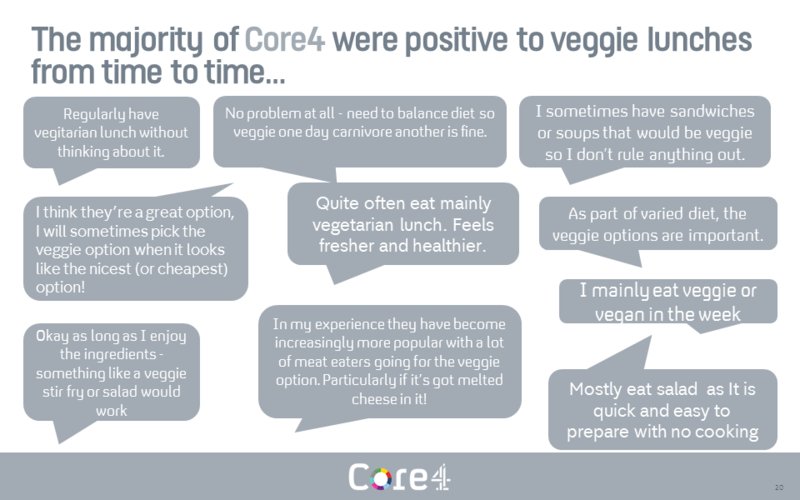 Some barriers get in the way when it comes to veggie options. 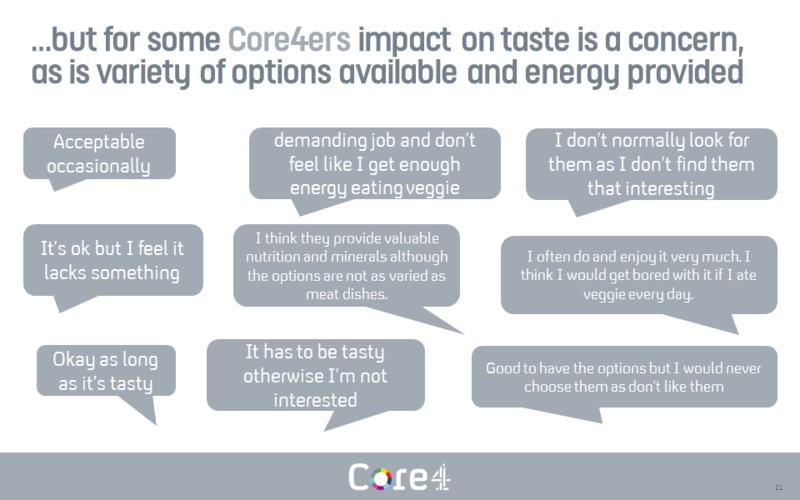 Consuming a few falafels can leave you feeling peckish while the lack of variety can sway decision making. Some food shops and chains in the UK frame a box of salad or a cheese sandwich as a vegetarian lunch substitute. This can leave Tribes feeling disheartened, especially the vegetarians when the only option is to have a generic bland lunch. 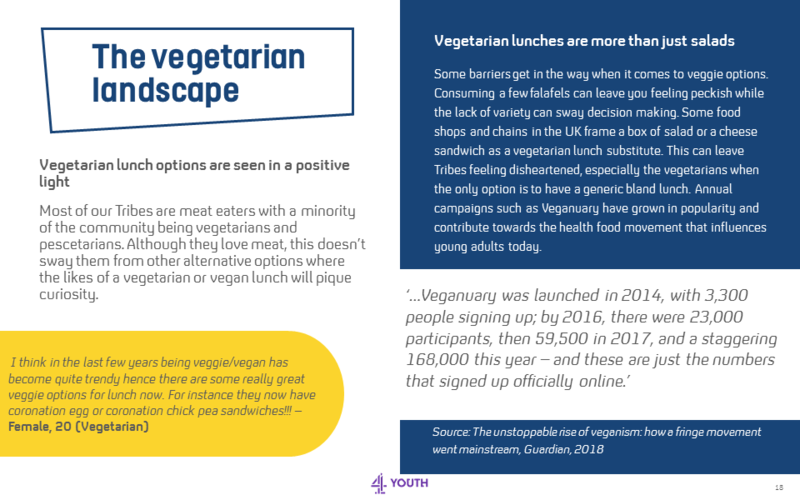 Annual campaigns such as Veganuary have grown in popularity and contribute towards the health food movement that influences young adults today. 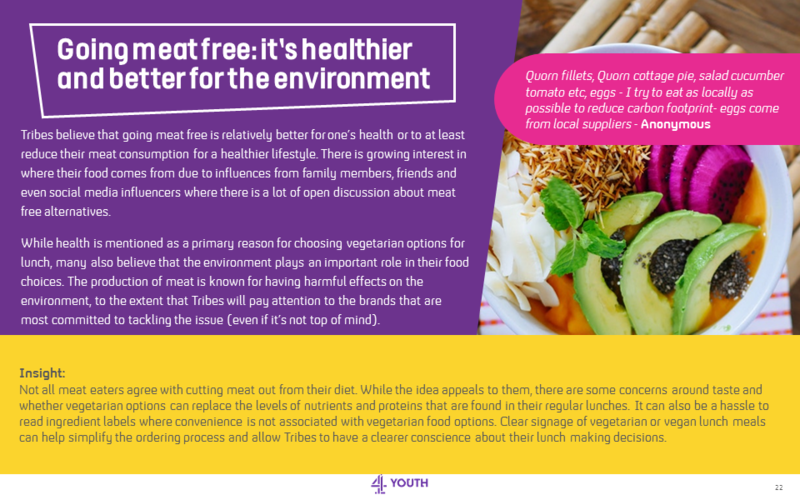 Tribes believe that going meat free is relatively better for one’s health or to at least reduce their meat consumption for a healthier lifestyle. 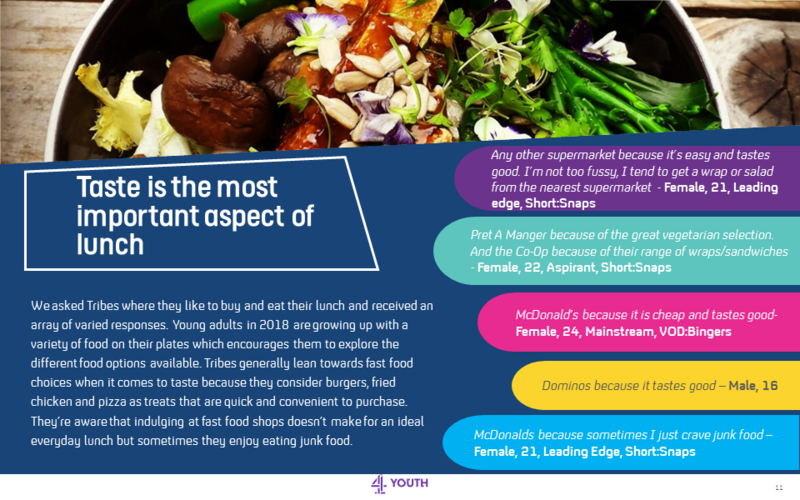 There is growing interest in where their food comes from due to influences from family members, friends and even social media influencers where there is a lot of open discussion about meat free alternatives. 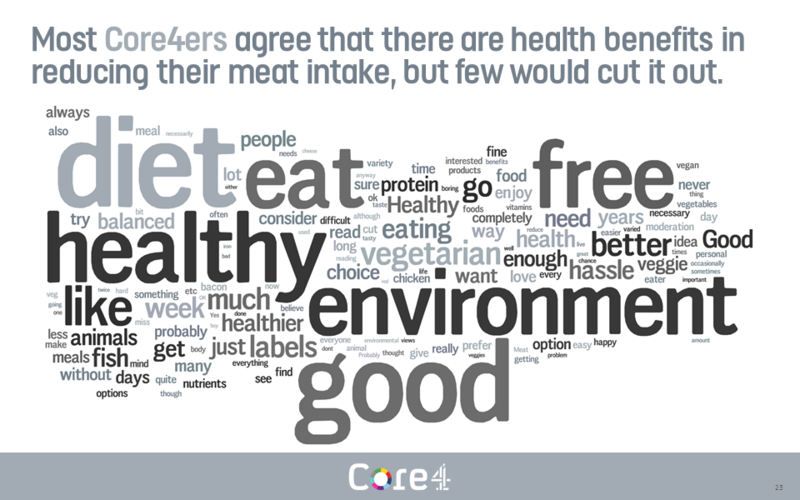 While health is mentioned as a primary reason for choosing vegetarian options for lunch, many also believe that the environment plays an important role in their food choices. The production of meat is known for having harmful effects on the environment, to the extent that Tribes will pay attention to the brands that are most committed to tackling the issue (even if it’s not top of mind). 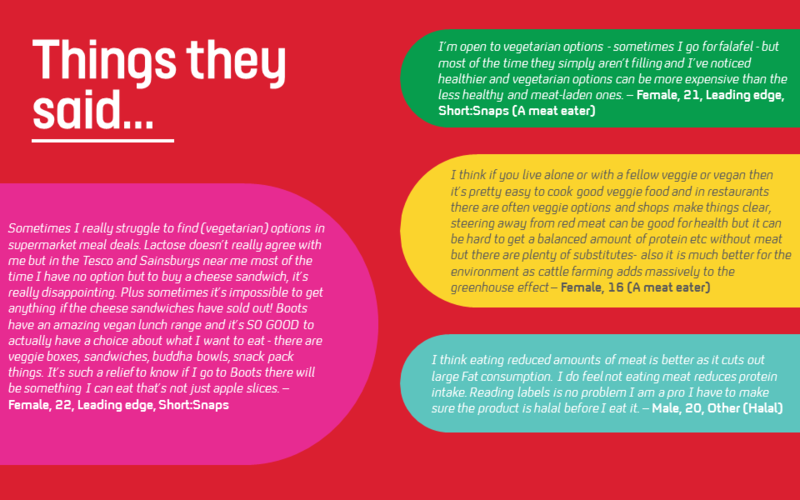 Not all meat eaters agree with cutting meat out from their diet. 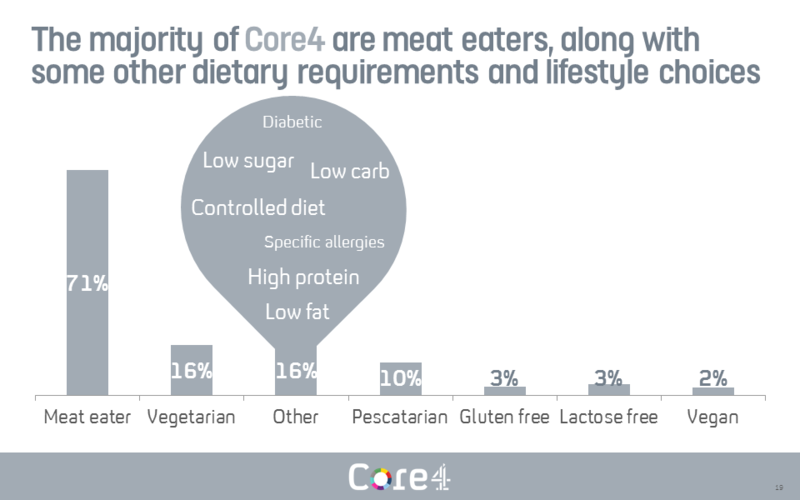 While the idea appeals to them, there are some concerns around taste and whether vegetarian options can replace the levels of nutrients and proteins that are found in their regular lunches. It can also be a hassle to read ingredient labels where convenience is not associated with vegetarian food options. Clear signage of vegetarian or vegan lunch meals can help simplify the ordering process and allow Tribes to have a clearer conscience about their lunch making decisions.